Flags and figures are Warfare Miniatures. Great work, congratulations; I like the shading on the light blue coats very very much! With such a single color coat with no linings and cuffs of different color that really catches the eye!We done! Another "great" unit! You really have become a great painter and hobbyist! Really outstanding work Truls! You say you are waiting for my units but I'm waiting for yours and I need to say that I'm luckier than you, because you rate of production is increasing dramatically in the last period. Keep painting!!!! Well there was a month and a half I didn't finish anything. But my Danish grenadierers were half done. 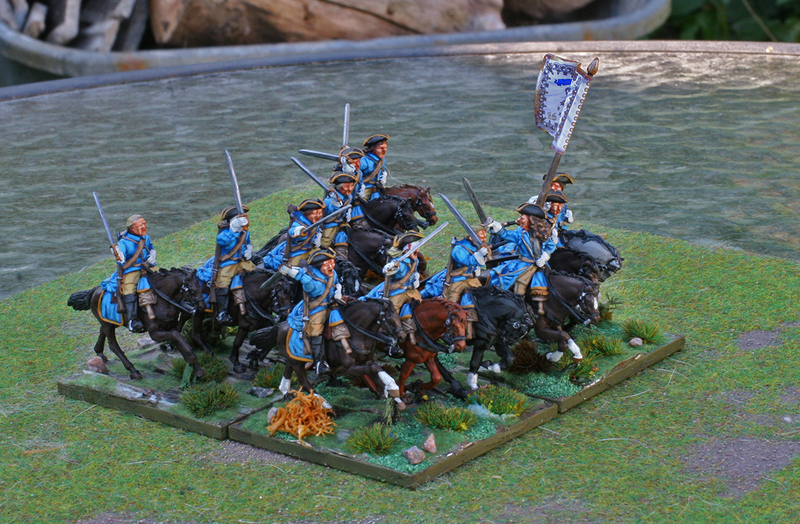 And a couple of days of intensive painting equals 6 cavalry. Now I have half a unit of Russians to finish. Well I couldn't improve on the quality, this is my max as of now. Great work, I love those colours and you've done a great job helping them stand out on the battlefield. Great stuff!